On September 1, 2015, a California jury awarded Kenneth Fry over $2.1 million in damages for an auto repair negligence suit he filed against Larry Miller Toyota. This is a very significant case because it proves that mechanic negligence has a serious outcome when these actions lead to accidents and personal injuries. Mr. Fry used the mechanic services of Larry Miller Toyota to replace a rear propeller in the driveshaft of his 1990 Toyota 4Runner. This repair was completed entirely at this dealership. Eleven months later, while Mr. Fry was driving on the freeway, the driveshaft fell out of his vehicle which caused him to be involved in an accident and become injured. Mr. Fry sued Larry Miller Toyota for mechanic negligence citing that the dealership was guilty of auto repair negligence because they failed to use thread-lock bolts when securing the driveshaft to the transfer case per manufacturer instructions and because of this, the driveshaft was not tightened properly and ell off of the vehicle. The defendant denies all allegations. Mr. Fry suffered spinal and shoulder injuries in the accident that required multiple surgeries and extensive physical therapy. After nearly three years, this case went before a jury and the jury found in favor of the plaintiff 12-0. It was the jury’s belief that the injury that Mr. Fry sustained to his neck and shoulder was the direct result of the mechanical failure of the vehicle and that this failure was caused by a negligent repair. Mr. Fry was awarded $2.1 million for damages and $70,930 for past medical bills. Properly maintained vehicles are necessary for the safety of the driver and others on the road. It is the responsibility of the vehicle owner to always keep their vehicle mechanically sound. Countless accidents occur each year in California because of mechanical issues, such as broken tail lights, that could easily be avoided. For a compete overview of how mechanical failures cause unnecessary accidents, please review my related blog post: Mechanical Failure Traffic Accidents In California. 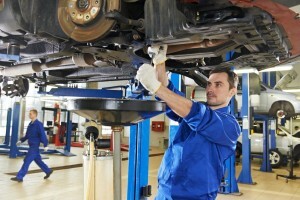 However, as any lawyer will inform you, if the owner of a vehicle has all the required maintenance performed on their vehicle to keep it safe and mechanical failure still occurs, mechanic negligence may be responsible for the accident and any injury that is caused by this mechanical failure. • All medical costs related to the accident. This will include future medical care costs if continuing treatment or therapies are necessary for the injured party. • Loss of income. This includes any losses that the victim incurred immediately after the accident and any losses they may have in the future because of the injury. A lawyer may also ask for compensation for losses to retirement funds or investment accounts that are part of an income package of the victim’s employer. • Pain and suffering. Depending on the severity of the accident and resulting injuries, the amount that the attorney may ask for in pain and suffering can only be determined on a case-by-case basis. Sadly, negligent repairs are not the only issue that vehicle owners face when it comes to having work performed on their vehicle. There has been a large amount of OEM and aftermarket vehicle parts that have caused problems on vehicles around the country. Defective replacement parts can lead to injuries and death to the unsuspecting vehicle owner who thought they were properly maintaining their vehicle. Falling under product liability law, these defective replacement parts have been connected to many accidents and deaths throughout the United States according to the National Highway Traffic Safety Administration. When this occurs, the manufacturer of the defective part is held responsible for the accident and not the mechanic or the repair facility that installed the part. If you believe that you have been injured as a direct result of negligence by a repair your mechanic made, you are encouraged to speak with a lawyer about your case. Under California law, you may be entitled to specific types of compensation for your injuries and losses, however, time is of the essence in these cases. An attorney needs to have your vehicle inspected by proper experts prior to any modification or further repairs being done to obtain the necessary evidence required to prove mechanical negligence.